Advances in both light and electron microscopy are improving scientists’ ability to visualize viruses such as HIV, respiratory syncytial virus (RSV), measles, influenza, and Zika in their native states. Researchers from Emory University School of Medicine and Children’s Healthcare of Atlanta developed workflows for cryo-correlative light and electron microscopy (cryo-CLEM), which were published in the January 2017 issue of Nature Protocols. Wright is director of Emory’s Robert P. Apkarian Integrated Electron Microscopy Core and a Georgia Research Alliance Distinguished Investigator. The co-first authors of the Nature Protocols paper are postdoctoral fellows Cheri Hampton, PhD. and Joshua Strauss, PhD, and graduate students Zunlong Ke and Rebecca Dillard. The Wright lab’s work on cryo-CLEM includes collaborations with Gregory Melikyan in Emory’s Department of Pediatrics, Phil Santangelo in the Wallace H. Coulter Department of Biomedical Engineering at Georgia Tech and Emory, and Paul Spearman, now at Cincinnati Children’s. For this technique, virus-infected or transfected cells are grown on fragile carbon-coated gold grids and then “vitrified,” meaning that they are cooled rapidly so that ice crystals do not form. Once cooled, the cells are examined by cryo-fluorescent light microscopy and cryo-electron tomography. Extremely low temperatures (well below -150° C) are necessary for cryo-fluorescent light microscopy and cryo-electron tomography. Performing the light microscopy steps after sample vitrification prevents the cells from continuing to grow and shift in position in between live-cell light and cryo-electron microscopy. The cryo-fluorescent light microscopy is facilitated by use of a heat-insulated, short working distance ceramic objective lens, Wright says. From Stobart Nat Comm (2016). Attenuated RSV keeps the F protein in pre-fusion state. 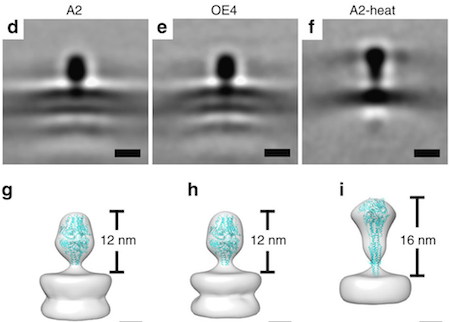 With the cryo-electron tomography data, it is possible to obtain images of individual intact viruses and viral proteins at high resolution – in some cases, close to atomic resolution — via sub-volume averaging, Wright says. This approach was used in a recent Nature Communications paper on RSV, demonstrating that a live attenuated vaccine candidate resembles RSV structurally. The cryo-CLEM technique works best with cells that can grow flat, because a standard electron beam can’t penetrate cell bodies more than about 1 micron (a millionth of a meter) thick. Mammalian cells are usually several microns wide, while viruses such as HIV are around 0.1 microns across. Wright’s work has been supported by Emory and Children’s Healthcare of Atlanta, the Georgia Research Alliance, the James Pendleton Charitable Trust, the National Institute of General Medical Sciences (R01GM104540, R01GM114561), the National Institute of Allergy and Infectious Diseases (R21AI101775) and the National Science Foundation (0923395).